- Quick Hitch Harnesses, Tail sets, etc. - Trail Riding Orange Stuff! Book three, Gwenonwyn of Aileen, in the Marla Mesconti Mystery series IS HERE! Haven't read Ritzforg 127 or Captain Courageous yet? Don't miss it. Available on Amazon and Barnes and Nobles.com in electronic format as well! RITZFORG 127 and Captain Courageous have received the 5-star rating with Reader's Choice! Gwenonwyn of Aileen just won a 5-star rating from Reader's Choice! Get your copy today! 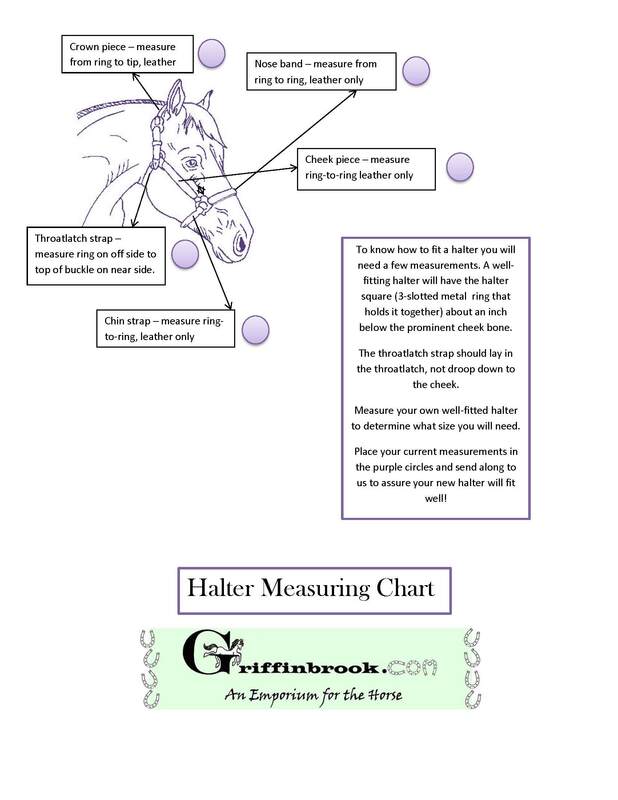 Click here to print a halter measuring chart if you aren't sure what size you need. Contact us with the measurements of your existing halter. NEW 2019 Dressage test books are available!! Orders over $69 ship for free in the US! Not all items are in stock, some are made to order. If you find any errors on the site be sure to let us know at 603-483-4833 or griffinbrook@aol.com.